The 2018 Emerge Film Festival EFFy Awards were presented at the fifth annual EFFy Awards held Saturday, April 28, at the Franco Center. 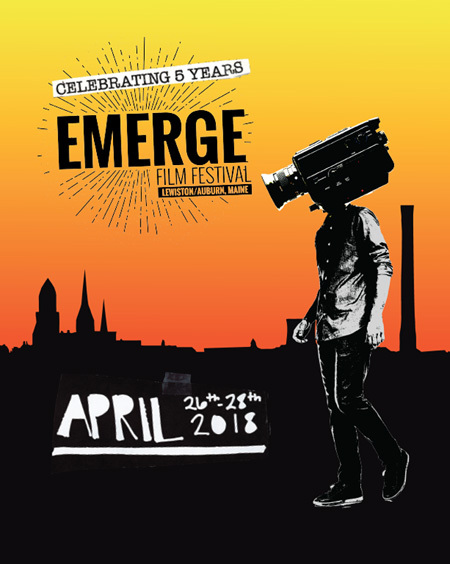 Emerge has launched a new Filmmaker Spotlight series highlights amazing Independent Filmmakers from around the world. Check out the latest Filmmaker Spotlight. The Emerge Film Festival, in collaboration with L/A Arts will be screening 'I Know A Man-Ashley Bryan', on Saturday April 29th. The documentary will be part of the inaugural ‘Artist Days in LA’ event. Directed by Maine filmmaker Richard Kane, this film is a celebration of Bryan’s art and life. We are so excited to announce that Peace, Love & Zoo has been selected for our Saturday feature film and will play Saturday April 29, 2017 at 7pm at the Franco Center. Peace, Love & Zoo was named best featured documentary at the International Film Festival in Berlin and we are so thrilled to bring it to Emerge! Maine director Reginald Groff and artist Zoo Cain are also expected to be in attendance. Check out the trailer for this incredible film that follows artist Zoo Cain and his passion and energy for life.